When setting the watchpoint the variable - which should be watched - must be in scope. (That is the program must be running and stopped at a breakpoint where the variable can be seen). For that reason watchpoints are only valid until the app exits and then will be disabled. On the next debug they must be enabled again while stopped at a location where it is in scope. Specified by Unit-name and Line-number. The execution will be interrupted before the pascal statement on the specified line is executed. Can be set by clicking the gutter in the source-editor. Specified by an address. The execution will be interrupted before the assembler statement at the address is executed. Can be set by clicking the gutter in disassembler window. Specified by the name of a variable. The execution will be interrupted when the variable is changed. It can also detect read access. Support for this depends on the platform used. A breakpoint can be enabled or disabled. If it is enabled, then each time the program reaches the breakpoint, the condition is checked and if results true, the action(s) set for the breakpoint will be performed. Filename/Address: The name of the file where the breakpoint is set. Line/Length: The line-number where the breakpoint is set. Filename/Address The address of the breakpoint. This type of breakpoint is useful if there is no source available. Filename/Address: The name of the variable. Normally a reached breakpoint performs the break action(s). When a condition is defined, this condition is evaluated. If this condition evaluates to True, the break action(s) are performed. The following actions are available: Break, Enable/Disable group(s), Log message, Evaluate expression, Ignore/Handle Exceptions. A complete description of these actions can be found on the Breakpoint properties page. How many times the enabled breakpoint has been reached. If a "Hitcount" is defined for this breakpoint, the debugger will perform the break action(s) when the hitcount is reached. The group where this breakpoint belongs to. This allows to quickly enabled/disable several breakpoints at once. 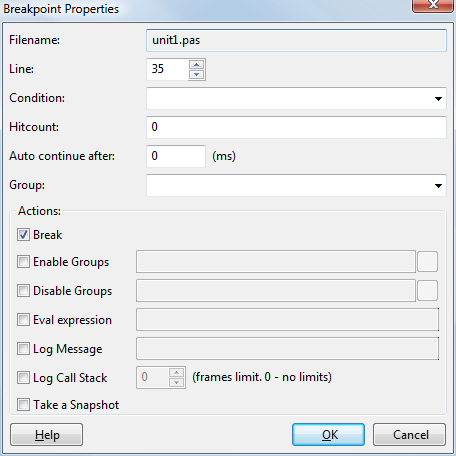 Change the properties of the current/selected breakpoint. Opens a property dialog for the requested type of breakpoint. The location/address/variable can be set in the property dialog. Clears or sets the group for the breakpoint. A list of existing groups will be in the menu. With "Set new group" a new group can be created. The breakpoint will only be triggered and perform the specified actions, if the condition evaluates to true. This can for example be used to test if a variable has reached a critical value. NOTE #1: The IDE does only apply a very limited pascal syntax fixing to the condition (#48 is escaped as char with ord val 48), so it needs to be C-like, so GDB understands the expression. eg: "i=2" or somechar='a'. Remember that the string (or rather char) value must be wrapper in single quotes, not double quotes. NOTE #2: Strings can not be compared. They are seen as pchar, so they can only be compared to an address: "str=0x5a0b40". But chars in a string can be compared (index is zero based/pchar) "(s='a')and(s='b')". The breakpoint will be ignored until it has been hit the specified amount of times. One scenario where this is useful, if an event is triggered by the focus change (between IDE and debugged app) when the app is paused/resumed. The ignored passes of the breakpoint to not alter the focus. NOTE: #1 The hitcount starts at 0. So if you want to break on the 10th iteration, set the HitCount to 9. NOTE: #2 The hit count doesn't reset until you stop/start the debugging or actually delete the breakpoint and set it again (without the need to stop/start the debug session). This also avoids the focus change between IDE and app. It however indicates the execution line in the source editor, which leads to a visible indication. If the time is long enough watches might be evaluated. A breakpoint can be is one group (one only). Groups can be used with the Enable/Disable group feature. 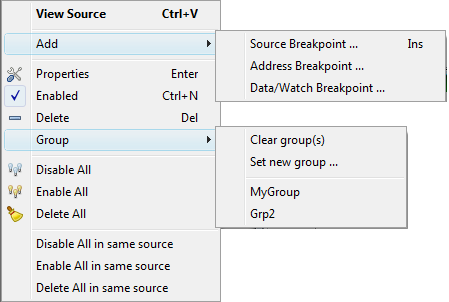 Enable/Disable Group: Enable or Disable all breakpoints in the given group(s). Usually 2 breakpoints would be set, one to enable, the other to disable. The breakpoints in the specified groups could then be enabled (or disabled) only, if they occur between the 2 points. The breakpoints that are changed could be in subroutines, that are called sometimes between the 2 points, but also from other locations. Take a snapshot: Evaluates all Watches, Locals, Callstack, Threads, and adds it to the snapshots in the History dialog. This page was last modified on 30 October 2016, at 17:40. This page has been accessed 13,860 times.